When my wife and I purchased our house nearly thirty years ago we wanted out of the city and into a good school district in which to raise our children. That house came with about a fourth of an acre of lawn to care for, but hey I was young and it good exercise right? I learned about lawn care from my father. I used to have to cut his father’s small yard with one of those old-fashioned push mowers; you know, the kind that are now in vogue now with the new urban renewal crowd. All that I knew was that it was hard work. My Dad introduced me to power mowers when I was old enough and I guess responsible enough not to cut my foot off…no safety features back then. 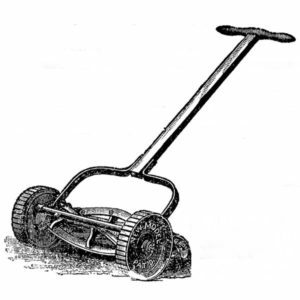 As much as I loved my father I have to admit that he was really quite cheap for certain things and lawn mowers was one of those things. He’d buy the cheapest mower that he could find. It would work great for a year or so then there’d be the next season where there was nothing but struggles getting the thing to start. When I was a teenager my right arm was significantly bigger than my left arm primarily because it took an average of thirty pulls to start the damn mower. Sigh. This is NOT the mower we bought. second one as the original mower isn’t quite cutting it if you get my drift. I am not very proficient at working on mechanical things which translated means that I find them very frustrating to deal with. So that would leave me with taking it to a service center. 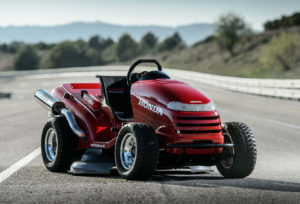 We had taken the mower to the dealership where we bought it for service a few times over the years, but they went out of business and we figured that we’d probably have to put a hundred dollars or so into it and still have a rather old mower even though it was a Honda mower. Off to Home Depot last weekend as they actually sell Honda mowers. Unlike the television commercials, the Home Depot employee knew enough about mowers and guided us through the different Honda choices. Yes, we were going to stick with the Honda. He even suggested that we buy gift cards at the local grocery store to earn “free gas” for the mower purchase. We’re getting our gas today or tomorrow. Weird thing is though that my wife paid to have our lawn “perfed” recently and we have all these small soil plugs in our yard. I didn’t want to use the new mower and have all of these plugs sucked up into the blade (I only use the mulching feature – I hate to schlep grass clippings to the compost pile). So out came the old Honda to save the new Honda. Damn thing started on the second pull after sitting in the shed all winter. I believe that I am sounding like a Honda commercial, but that wasn’t my intention. I may actually use the old mower one more time because of the plugs. I did notice that the level of vibration of the old mower left my arms tingling for a very long time. Oh and it runs really loud, but it still runs. Don’t get me started on weed-whacking! I bought a really powerful one last year and now have to wear long pants or gators or just accept the dozens of cuts from flying debris. And what sick mechanical engineer designs the systems by which you have to add more line? I had to undertake this arduous task about halfway through my landscaping last weekend. What a frustrating experience wrapping stiff line around a small circumference and then trying to schlep into the two small holes on the head before it all unsprings. I needed more than the two hands God gave me! This post actually was supposed to be a story about minimum wages, but I got a little off when I started to think about the past. I went to add the “economics” aspect of the story, but I didn’t want to take away from the rest of the story so I used the backspace key and took it out. I’ll have to do that in a separate post. That will be a fictional piece…soon. This article was published on Apr 23, 2016 . It is tagged greens keeper, honda, mower. You can follow any responses to this article through the comment RSS feed.